If an employer asks for salary requirement then you should include a cover letter with salary requirement. You may wonder that why an employer has asked for your salary information. So, by the help of your salary requirement, an employer will know whether you are over qualified or under qualified or just fit for the job and meet the right expectation. A cover letter with salary requirement helps an employer to make the right selection of the right candidate. He will know that whether you will meet the expectations or not. An employer also decides your income on the basis of your cover letter with salary requirement. 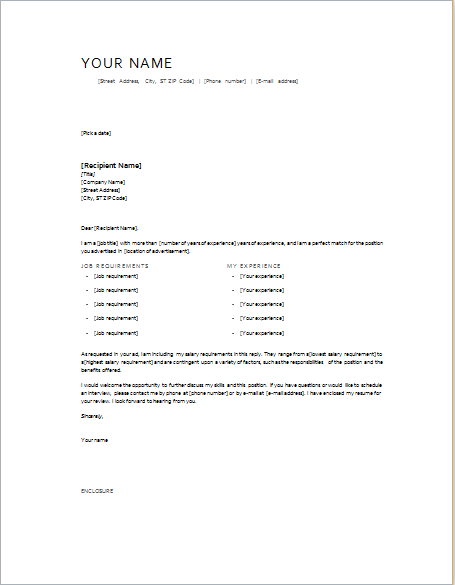 How to Write Salary Requirement Cover Letter? Search the job data and salary on the internet and on different websites and find out all the details relevant to salary requirements. You should also get in touch with all the professional organizations which are involved in the industry. You can also call an employment agency and ask them for all information about the salary of the job in which you are interested in. Once you have collected all the data, you can use that data to make your salary range. Start with the minimum salary and then go for an upper salary range. Your salary range should be based on your experience and qualification.